The legendary handheld takes its rightful place amongst the hallowed toys of legend like Mr. Potatohead and The Cardboard Box. The Strong National Museum of Play, located in Rochester, NY, is the only museum that's dedicated to the simple act of play and how it informs our culture. Since 1998, the Museum has inducted toys into its National Toy Hall of Fame which follow the following criteria: icon-status, longevity, discovery, and innovation. 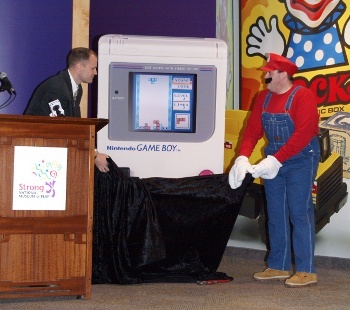 So far, 44 toys have been honored, including this year's class of the ball, the Big Wheel, and the Nintendo Gameboy. The Gameboy, joining the Atari 2600 as the only other electronic game on the roster, was an historic piece of hardware for its time. When it was released in 1989, it seemed like every school-age child carried one around and whipped it out at the first sign of boredom. Kids loved it because it could fit into any pocket, and parents loved the Gameboy because it kept the kids occupied on long car rides. Plus, and this is purely anecdotal, it was the first gaming system that I ever saw a girl play. The innovative Nintendo Game Boy transformed the electronic games market by popularizing handheld gaming. No video-game platform did more to put gamers "on the go" than Nintendo Game Boy. And go they did-bringing their gaming experience to school, to summer camp, and to the back seat of the family automobile. Over the past two decades, Game Boy has become synonymous with portable gaming fun. It makes perfect sense to me that the Gameboy is so venerated, but I am little concerned with some of the other "toys" on the list. I understand how iconic the ball is, given its ubiquitous history. I can maybe even understand the cardboard box after I saw Calvin turn it into a Transmogrifier. But the stick? Really? A stick is in the Toy Hall of Fame? You might as well just put a rock, a piece of paper and a pair of scissors in there, too. What? That's the class of 2010? Wonderful.